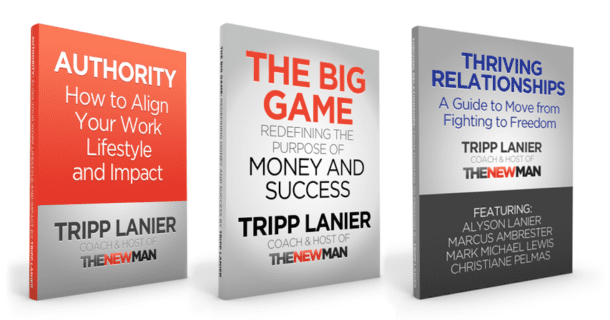 This is the final episode in this series where we explore some of the big ideas in The New Man 360 audio course. And one of the things we talk about a lot in the course is this notion of purpose. Do You Buy Into This Myth? I have to find my purpose in the world! And I also have to pay the bills doing what I love! This is quite a trap. First there’s this idea that your purpose it “out there.” It’s some role or activity or goal or finish line. While these things can be very purposeful, it’s a mistake to attach our self-identity and self-worth to them. Why? Because our experience of doing them will change. At one point, doing XYZ may have made Joe feel very alive and given him a strong sense of meaning. He may have said that XYZ was his purpose. But how does he feel about it 5, 10, 20 years later? It would be a tall order to expect that he would still have the same experience. After all — change is the only constant. I believe our purpose is the experience of feeling more alive, to experience that state of flow while doing it, to feel that sense of meaning, to feel the peace of mind it brings, to feel more open-hearted and loving, to feel more free. It’s the experience, not the thing itself. The thing itself — the activity, the goal, the mission — is just a pathway to the experience. For instance, I’ve always been creative. As a kid I loved to draw. Then I got into music. And then I got into creating TV shows and programs. And in the last ten or so years I’ve enjoyed the creative process of coaching and helping others through The New Man Podcast. For me, it’s always been about the experience of creating — whether it was a literally painting or helping others see their lives as the canvas. Had I married myself to just drawing or just music I’d be miserable. The purpose has always been to honor that amazing experience of creating while being willing to let that guide me wherever it may go. I have no idea what is next. But I’m sure change will come. Bottom line: Your passion is not some thing or activity. Passion is simply an experience, and the path will change. Be willing to change with it. But Wait! What About the Money? I have to have my purpose support me financially. Yikes. What a ton of pressure to put on something that is so rewarding. I meet so many guys that say they don’t know what they want to do, and when I ask them what they would do if they didn’t have to make money from it they rattle off a list of things they love to do. And the sad thing is they’re not doing what they love because they can’t justify doing it because it doesn’t make money. They’ve used money as a way to justify whether something was worth doing. What a waste! So let’s flip it: Imagine if your job, your relationships, where you live, how you live — imagine all of this was here to empower you to do what you love. Imagine if all of these things were aligned to actually help you do what you love and to do what has you feel a deep sense of joy, flow, and meaning. Because that is how it is. Big takeaway here: Your job empowers your purpose. Not the other way around. Stop using your job or your finances as an excuse to avoid doing what you love. Figure out how much you need to live per month and do what you love to do. Then get creative and find ways to earn that number in a manner that empowers you to do what you love. Simple? Yes. Easy? Not unless you practice. Take the pressure off of what you love to do to carry your financial load. Just start doing it at the level you currently can. Get really good at creating this experience in your life. You never know where it may lead you, but your life will be much, much more fulfilling. And by doing this you’ll be much more enjoyable to be around. You’ll be way more generous and open hearted. You’ll be a better husband, father, and friend. And your positive energy will be a reminder that we need to get off of our own asses and do what we love, too. Here’s to you, me, all of us living a life we really love.